This sunny Wednesday evening saw the fourth meeting of the Reading Wales book group at Palas Print in Bangor. It is great to have our regular members who make the group each month. If you would like to join us next month, click on the book group link on the home page. 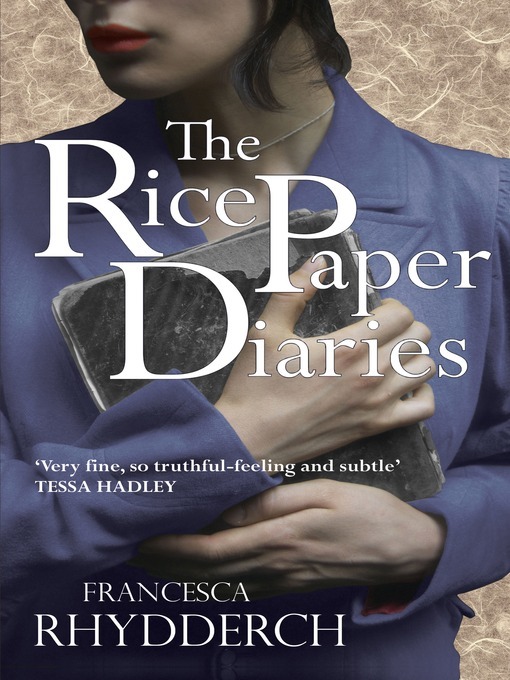 This month we read Francesca Rhydderch’s debut novel ‘The Rice Paper Diaries’ which was published in May this year. After reading a lot of Welsh classics (and on Eirian’s good authority that it was an interesting read! ), it was refreshing to read a new release. Generally there was a positive reaction to the novel – it was easy to read and we found the fictionalisation of the invasion of Hong Kong fascinating. We agreed that it is an aspect of the Second World War that is rarely spoken about and members of the group who enjoy historical fiction particularly liked ‘The Rice Paper Diaries’. Most of us agreed that it was Elsa and Lin’s sections of the book we enjoyed the most. It seemed that more research had been placed on these sections of the book. In these two sections Rhydderch achieves a brilliant sense of place as we really get to know what 1940s Hong Kong was like. Where Rhydderch succeeds in the first half of the novel, we felt the same sense of place wasn’t quite achieved in the second, particularly in Mari’s section. We did enjoy the evocative description of Mari’s coming home on New Year’s Eve, travelling across West Wales in the dark. Rhydderch skilfully conveys Mari’s uncanny homecoming. She has heard her mother describe this journey many times in stories but the reality is unnerving. Yet, we felt that the dramatisation of New Quay didn’t match up to the sense of place achieved in Hong Kong. We wondered whether this was because the narrator is speaking through Mari, a young child who is only six years old. Would this section have been different had Mari’s character been a bit older? The relationships between Elsa, Tommy and Oscar generated a lot of discussion. We really felt for Elsa and the loss of her baby at such a young age. Some readers thought Tommy’s section of the book could have been developed to show more of his thoughts and his interaction with Elsa, however we appreciated that the regimented style of the diary entries suited his personality. The polyphonic nature of the book sparked the most discussion. We spoke about other books that use this technique and agreed that we would have liked more variation. For example, once we had finished Elsa’s section we were disappointed that that was all we were going to hear from her – we wanted more! It would have been interesting to hear more of her thoughts, particularly whilst at the camp and about her relationship with Oscar. We all agreed that the most subtle parts of the novel were the most effective. The reference to Elsa and Nannon’s kitchen table at the beginning and end of the book was brilliant. These moments really cemented the themes of family and home and what this meant in war-time Wales. It was these poignant moments (as well as minor, yet believable characters such as Lei the letter writer) that made the novel. Rhydderch has a talent for creating poignant images that stay with you long after you have finished reading. As a student of Welsh writing in English I was interested to see whether or not a novel like this could be studied on a Welsh Writing module. After reading it I think it would fit in well because it discusses themes such as exile and homecoming which are always present in Anglophone Welsh literature. This then led to a discussion amongst the group where we considered that all of the books we have read so far have similar themes –prompting one reader to advise us to read Harri Webb’s poem ‘Synopsis of the Great Welsh Novel’. Clearly Webb was onto something here! Francesca Rhydderch will be talking about ‘The Rice Paper Diaries’ at the Gwyl Arall festival in Caernarfon next week. More information can be found here.